Sunday, Sept. 23, 1888 Very pleasant & as warm. Merc 80°. 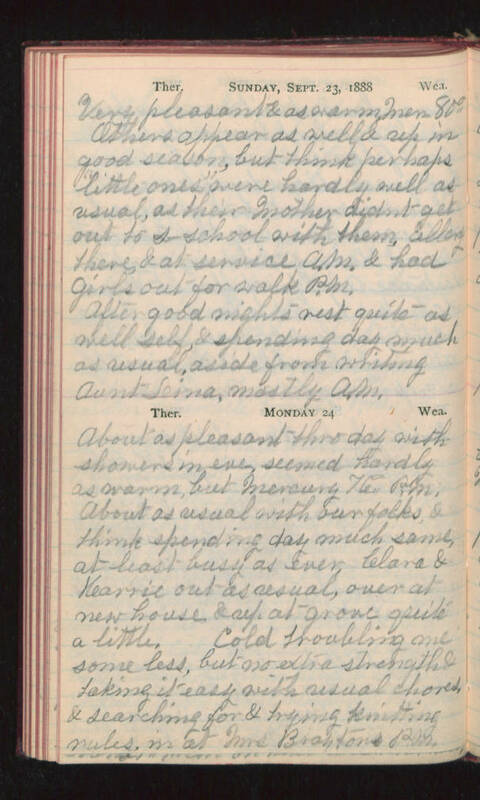 Others appear as well & up in good season, but think perhaps "little ones" were hardly well as usual, as their Mother didn't get out to s-school with them, Ellery there, & at service A.M. & had girls out for walk P.M. After good nights rest quite as well self, & spending day much as usual, aside from writing Aunt Lina mostly A.M. Monday 24 About as pleasant thro day with showers in eve, seemed hardly as warm, but Mercury 76° P.M. About as usual with our folks, & think spending day much same, at least busy as ever Clara & Karrie out as usual, over at new house & up at grove quite a little. Cold troubling me some less, but no extra strength & taking it easy with usual chores, & searching for & trying knitting rules, in at Mrs Brayton's P.M.